Maine schools have to provide all of the training that has been mandated by the State. 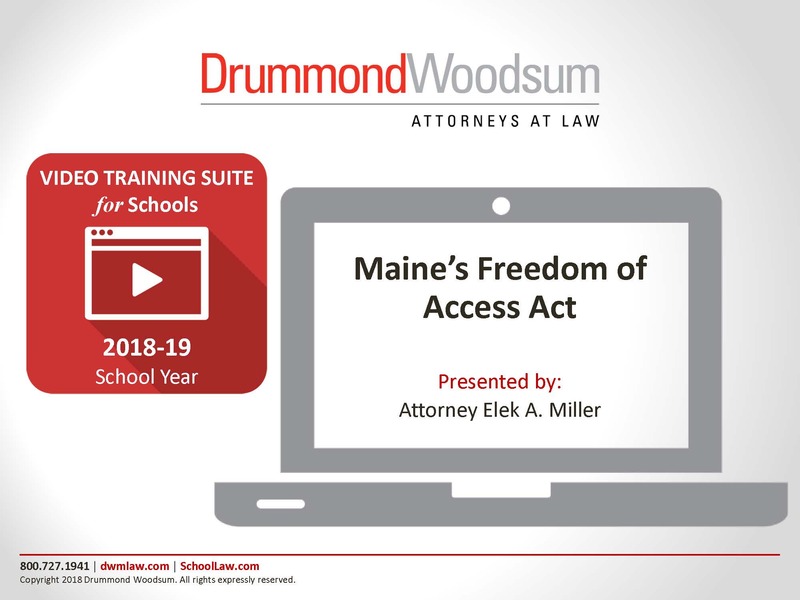 Maine's Freedom of Access Act requires all elected school board members and all public access officers to receive training in the requirements of the Act within 120 days of taking the oath of office or being designated. Are you wondering how best to accomplish this and other training requirements? Drummond Woodsum has created a Training Video Suite designed to satisfy these training mandates in a user-friendly and economical way. Subscribers will be able to view each of the seven videos on an unlimited basis during the 2018-2019 school year, after which time the videos will be updated and re-issued for another year by subscription. All your training requirements taken care of in one convenient place! Purchase this individual training video here for $290. BEST VALUE: Purchase the entire suite of seven training videos (average length is 30 - 40 minutes) and receive a 30% discount over the cost of the individual videos ($1,205). Previous purchasers of the video suite will receive a discounted renewal rate of $799.